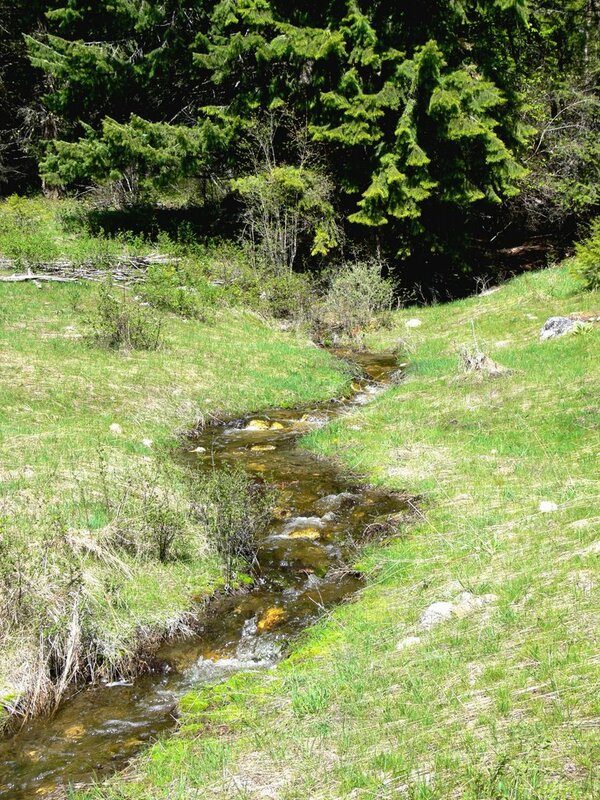 This is a little spring up on the ranch where we used to play as kids. Its about a hundred yards from where we're building the cabin, and it makes the prettiest music. Its a sparkley soothing little stream that you can easily jump over, and that eventually dries in the summer. But it shows up every spring to help the buttercups bloom and to serve icy refreshment to deer and once in awhile, to an old hook whittler who seems quite fond of the place. One of my playmates who lived on the ranch and played in that spring way back when; was my nephew Sonny, who is actually 2 years older than me (i'm the baby of a much older set of siblings). Actually there were several of us who loved to hunt for frogs and look for gold in that little spring, but its extra special for Sonny. Sonny's mom and dad divorced around about the time that my dad died (in 1953) and we had to sell the ranch. Sonny had to move away to Oregon with his mom, so we didn't get to see him much, but cherished the few times he was able to come home for a visit. And where would Sonny want to go on his rare visits? Up to the ranch, of course. So even though we didn't own the place anymore, Mom would pack a picnic basket and we'd pay the ranch a visit and get re-acquainted with that little spring. Sonny would try anything. Broke his arm once, pretending he was Superman. He set his pants on fire by riding his trike through a pile of burning leaves. And when he'd visit it was like a holiday for me. Life was good when Sonny was around. He loved comic books and would read them aloud to us. Ah but the years go by and so does life. A few years back (right after we were finally able to buy the ranch back) 4 of us guys rented a Lincoln Towncar and went on a road trip down to Oregon to visit Sonny. What a ball we had. But it was very sad too, cause it was our last visit with Sonny. He died a couple months later from cancer. Sonny loved the crick as much as any of us, and no one was happier to hear the news that we finally got the place back. In fact before he died, Sonny asked if we would take his ashes back home to the ranch. So us guys made Sonny a little rustic mortar and stone shrine under the boughs you see in the picture, next to this little spring. His ashes are behind a cedar marker with his name outlined in .22 shells (he loved to shoot), and he's resting there now by the spring we all love so much. And you know what? I've been up at the ranch numbers of times when the weather has been bad all around, but overhead there's a patch of blue. I figure its Sonny looking out for us. Just a little more Deadman Crick history. Not hooks, but something i felt like passing along. Jim, what a moving story. OK, I got teared up too, what a sweet story Jim, your words flow like that crick, beautifully. what a beautful place it would be to go and crochet...wish I could look out anywhere near here and she something so nice. Instead I just go to a nearby park with a really nice waterfall. Thank you for sharing that, Jimbo.